It’s Carnival season again, a time to eat, drink and be merry! Yes it’s Carnival season again and we are crazy busy prepping the house for our traditional Costume Party this coming weekend. It’s the 4th time we are hosting it and I can’t believe how busy it’s getting: eighty guests confirmed so far and counting! To be honest, I break a sweat every now and then just thinking about a possible overflow especially with this nightly chilly weather, but what’s really keeping me awake is my costume preparation. You see the stakes are high and competition is tough! Over the years, we’ve had a pretty amazing turnout starting with a knock-out Cleopatra with her suitor Marc Antony; a distinguished Marquis de la Fayette, a few prohibition gangsters, the last remaining punks on the planet and a Disco queen or two. Imagination is paramount but my creative juices aren’t exactly flowing lately, thus the stress. To try and find some much needed inspiration I decided to flip thru pictures of major Carnivals around the world. It turns out I found some 50+ Carnivals worldwide and I mean Carnivals as in celebrations held before Lent every year! Speaking of which, do you know that some scholars believe the word ‘carnival’ comes from the Latin expression ‘Carne vale’ meaning ‘farewell to meat’ while others say it comes from an Italian phrase ‘Carne levare’ meaning ‘remove meat’. Traditionally the Lenten period in the Church calendar (the forty days before Easter) was a time of fasting and penance when no rich foods or celebrations were allowed. So the whole community would get together right before the beginning of Lent to party one last time, drink and eat all the meat, dairy, fats and sugar that had to be disposed of. 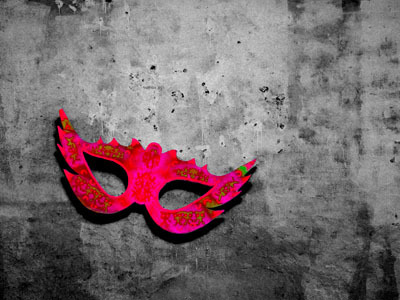 Because the Italian word ‘carne’ can also be translated as ‘flesh’, some say that Carnival was also a time to bid ‘farewell to the flesh’ meaning to let go of your everyday self, thus the wearing of masks, which allowed people to remain anonymous and mingle freely regardless of their social background. But enough said; here are the pictures I selected as possible inspirations for my party costume. Take a look and let me know what you think. Contender #1 is this colorful, sparkling, and amazingly skimpy parade costume, straight from the Sambadrome at the Carnival of Rio de Janeiro the “greatest show on earth”. Just looking at the outfit, I started humming “shake, shake, shake, shake your booty” but then I figured with an outside temperature of 25F it might not be such a great idea after all. Besides I am only half way done with my P90X program so I think I’ll just save the look for next year. 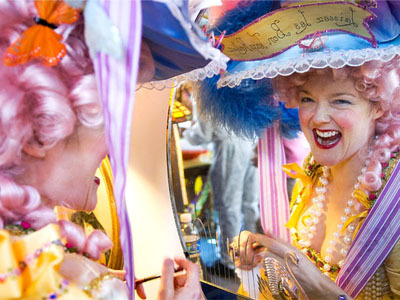 Contender #2 is this sweet, whimsical Marie-Antoinette outfit spotted at Mardi Gras in New Orleans. I love the pink baroque wig, the cheerful brocade dress complete with the string of beads –a tradition in New Orleans since the late 19th century and the feathered hat which reads “Laissez le Bon Temps Roulez” (let the good times roll in Cajun) a reminder that the celebration of Mardi Gras was brought to Louisiana by early French settlers in the 1700s. This is a serious contender! 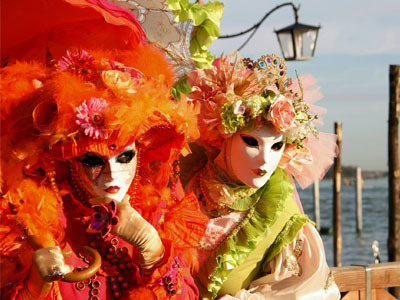 The final option is this pair of colorful costumed and masked party-goers photographed at the Carnival of Venice. I love the richness and bright hues of both outfits. I am not a less-is-more type of person so the flowers, the ribbons, the neckpieces, the jewels, the gloves, well… they all do it for me. The traditional masks with the almond-shaped eyes, and no mouth also add a touch of mystery that I found irresistible. So what do you think? Any preference? I’d love to hear from you but hurry, my party is right around the corner! Great blog, I see why you like pink…. beautiful pictures. J’attend avec impatience les photos de ta soirée!